Darryl Kile, a professional baseball player, died at the age of 33 on June 22, 2002. 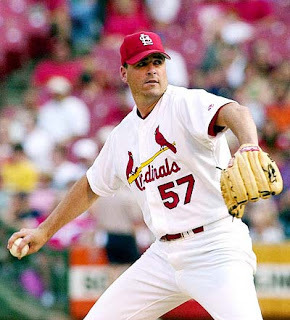 At the time, he was a star pitcher for the St. Louis Cardinals. The team was in Chicago for a game against the Chicago Cubs and Kile failed to show up at the ballpark for pre-game warmups. Team officials would return to the team hotel to find a “Do Not Disturb” sign on his room door. Sadly, Kile was found dead in his bed, with every indication that he died in his sleep. Kile was survived by his wife and 3 young children. It was a particularly sad week for Cardinals fans. The team’s long-time announcer, Jack Buck, died after a long illness earlier in the week. An autopsy showed that Kile died of a massive heart attack. Two of the three main coronary arteries had 80-90% blockage. Of course, it’s unusual for a seemingly healthy 33-year-old, yet alone a professional athlete, to die from coronary artery disease. Kile had passed the annual team physical which included an EKG and blood tests during spring training. We would come to learn, though, that Kile’s father also died shortly after suffering a heart attack in 1993, at the young age of 44. Kile’s death may have been unavoidable. For readers here at the blog who have a family history of coronary artery disease, it’s particularly important to pay attention to modifiable risk factors (such as smoking, obesity, diabetes, high blood pressure, etc.) and to any warning signs (such as chest pain/discomfort or shortness of breath) for coronary artery disease. Important topic…but conclusion is not helpful (modifiable risk factors) and warning signs were absent in Kile as would be true with MOST people with a family history of CVD. Advanced lipid testing often reveals an abnormality like Lp(a), a very dangerous particle in many people with such a history. And noninvasive imaging, carotid IMT and coronary calcium shows disease YEARS before sudden death—time to recommend real predictive tools rather than a wait and see for modifiable risk factors, symptoms or a positive stress test—they are not there in >90%. EarlyDetectDoc points out the importance of recognizing a family history of coronary artery disease. In those individuals, additional screening tests for occult coronary artery disease may well be useful. Perhaps EarlyDetectDoc knows more about Kile’s medical history than I do. I don’t personally know that warning signs or modifiable risk factors WEREN’T present in his case.